The world of retail has a unique set of source-to-pay challenges and demands including: shrinking margins, seasonality, management of brick and mortar stores and the growth of online shopping options. 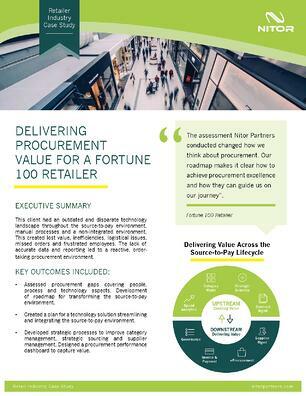 These dynamics have fueled the need for efficient source-to-pay technologies and processes to manage today's retail procurement strategy and scale for the future of retail. Learn how Nitor's services streamlined the source-to-pay environment for a Fortune 100 Retailer delivering over $40MM in savings and reducing employee turnover. Nitor is the leader in source-to-pay transformation with a single focus – empowering clients to achieve source-to-pay excellence. Nitor has a dedicated focus on spend management and delivers services across the source-to-pay spectrum. Our strength is in our breadth and depth of experience. Our team of spend management experts help companies from every vertical develop category management strategies, deliver complex sourcing initiatives, implement new technologies and transform their entire procurement process.